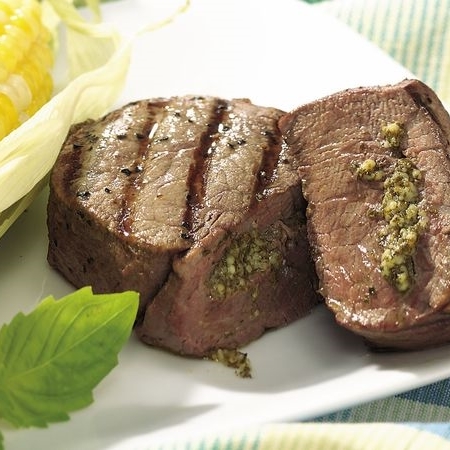 Try this pesto stuffed beef tenderloin for your next cookout. 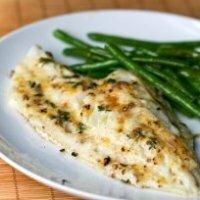 Perfect for grilling or you can broil it as well. 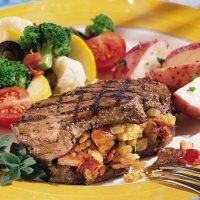 This is not a low calorie, low Weight Watchers Points meal, so be sure to save up some extra points and enjoy this steak for a hearty meal. With pesto on the inside and butter brushed on top, this grilled dinner has tons of flavor to please even the pickiest of eaters. This beef tenderloin recipe is stuffed with the taste of bold basil flavor from the pesto. Cook it to your desired taste. With a sharp knife, make a 1 inch slit in the side of each steak. Make a pocket in the steak by moving the knife around. Spoon half of the pesto into each steak spreading it around. Melt butter in microwave on low power. Add salt, pepper and garlic powder. Blend to mix well. Brush each side of the steaks with 1/2 the melted butter. Place steaks on grill approximately 4 to 6 inches from heat. Cook for 3 to 5 minutes (depending on desired doneness). Turn steaks and brush with remaining butter mixture. Cook for an addition 3 to 5 minutes. Remove steaks from heat and cover. Allow to rest 2 to 3 minutes. Nutrition facts shown below for the pesto stuffed beef tenderloin are per serving. The number of serving is noted in the header section below. The serving size is the first item noted on the nutrition facts table. All ingredients for the pesto stuffed beef tenderloin were included with calculating the Weight Watchers Points. For the desired doneness of your steak, use the finger/thumb method of your hand. Check out this article How to Tell when your steak is done. 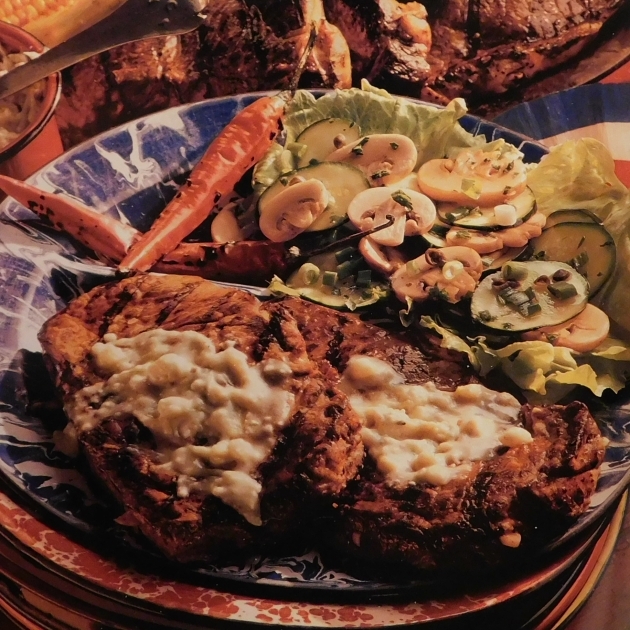 This ribeye is stuffed with garlic and topped with the bold flavor of blue cheese. 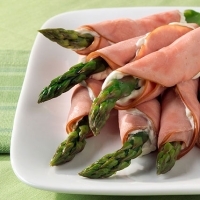 This healthy appetizer recipe is a great way to get in your veggies for the day. 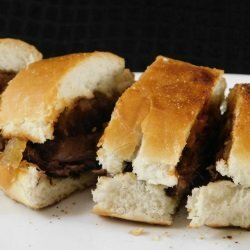 The mild flavors of this recipe has only 1 Weight Watchers FreeStyle SmartPoint. 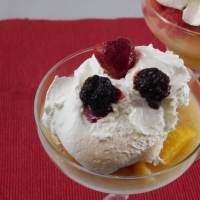 Indulge in this frozen treat for only 1 Weight Watchers Point. This is sure to delight your taste buds. Pack your day with power and add some of these foods to your daily diet. Add some interval training to your exercise routine. Use these example workouts to get started.